We have a proven record of providing high quality Economics qualifications developed through teacher feedback, operational experience and working closely with the wider academic community. To assist you in delivering our specifications, we offer a comprehensive range of support and resources including direct contact with our business subjects team, resources to help you plan and deliver our courses, and teacher CPD courses. 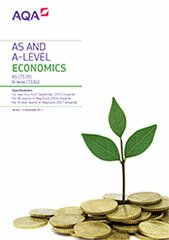 Why AQA for AS and A-level Economics? Our approach to Economics is to apply economic theory to support analysis of current economic problems and issues, and encourage students to appreciate the interrelationships between microeconomics and macroeconomics. Content takes into account fundamental advances and changes in economic ideas such as behavioural economics, importance of financial markets and development economics, so that students can relate what they are learning to the world around them. Our AS and A-levels can be taught together or independently, so you can choose the approach that best suits the needs of you and your students.